You. Your Neighbors. Your Neighborhood. Connect Now and Save. Members receive 25% off your first ad with the Windermere Observer! 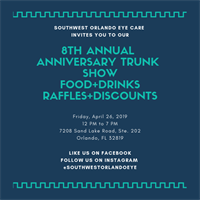 Southwest Orlando Eye Care Trunk Show Promotion! Extra 10% off on trunk show day!! Want 10% Off the Sale Price? All West Orange Chamber Members get extra benefits on Trunk Show Day! Inspired by Italy’s Lake District, Terralina Crafted Italian brings crafted Italian cooking and everyone together around genuine flavors and authentic dishes. Featuring a wood burning oven and signature craft cocktails, Terralina Crafted Italian has a perfect vantage point on Lake Buena Vista from the patios. Reserve your space now to receive a round of cocktails or a Visa gift card! Virtual Guardians specializes in internet, phone and cloud solutions and represents over 160 providers of these services. We work for and with you to select the vendor that perfectly fits your needs. You get the benefit of over 30 years of combined industry experience. We work in this area every single day, so our knowledge and expertise is refreshed with each customer that we help. Put all of our experience to work for you and see how great it is to have a Virtual Guardian in the technology world. Are you clear on the ''Why'' of your business?